Notgames Forum | Creation | Technology | "field of view"
The area that your monitor occupies in your physical view usually doesn't correspond with the virtual projection. 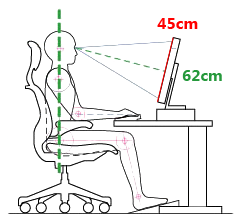 For instance, if you have a screen that is 45cm high ( comparable to a 27 inch iMac ) and your eyes are 62cm away from the screen, the virtual field of view should be 40 degrees ( vertically ). In order to ensure a matching field of view you could use head tracking, as demonstrated in this video. Unfortunately this technology never caught on ( VR to the rescue? ). Fortunately humans are pretty good at reinterpreting ( moving ) pictures that don't correspond with their natural field of view. We've been conditioned by looking at print & TV ( shot using various lenses & zoom-levels ) from various angles & distances, so our brains ( usually ) deal with it sans problème.